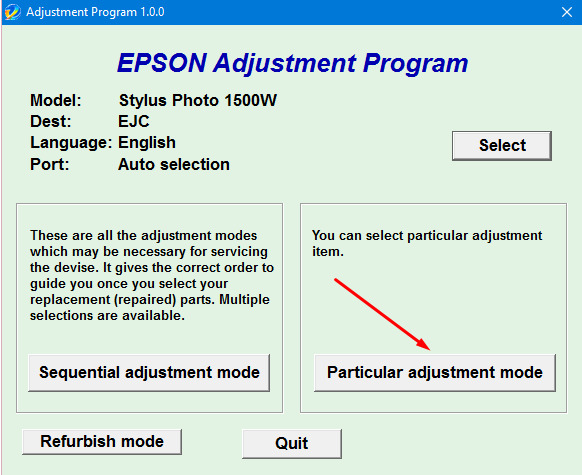 – Epson SP-1500 AdjProg or Epson SP-1500 Adjustment Program or Epson SP-1500 Adj Program, is a middleware developed by third-party software to supply for Epson SP-1500 printer, making printer continuous printing without error. – Compatible OS: Windows XP, Window 7, Windows 8, Windows 10. – Service Required, A printer’s ink pad is at the end of its service life. please contact epson support. – 2 red lights flashing alternately on Paper lamp and Ink lamp. – Epson SP-1500 Printer does not printing. – During printing, Ink is not only for printing but also for other printer operations like cleaning(head cleaning, pattern cleaning…), a certain amount of ink is wasted and it is collected by the waste ink pad. Therefore, the printer counts the amount of waste ink. – Once the amount of waste ink reaches the predefined limit, the printer indicates “Service Required” and the waste ink pad should be replaced or reset waste ink counter value stored in EEPROM on the Mainboard (or Logic Board) of the printer by Epson SP-1500 Adjustment Program. – Price: $35 USD – $50 USD. – Usability: Quite difficult to remove and reinsert the Waste Ink Tank for people who are unfamiliar with printer repairing. – Price: $ 5.86 USD. – Usability:easy to use, so everyone can use it. – Because Adjprog.exe gets Hardware ID info –> Antivirus will misunderstand Adjprog.exe is the virus ==> you need to disable antivirus or firewall before download and install Adjustment Program. – Connection of printer to computer must be using a USB cable.